The Russians didn’t just screw the red hat wearing Chumph fools – they screwed their favorite news sources as well. By now, the Russians use of bots to control Breitbart and Alex Jones’ Infowars site are well known. The Russians, given free reign by white wing press whose journalistic integrity is only just below that of supermarket tabloids announcing the latest sighting of Elvis, or little green men from Mars. The formula to get them to bend over was simple, make it salacious and anti-Liberal. Within those confines the slow-witted ignorati would absorb and believe anything. On July 17, 2014, Malaysia Airlines Flight MH17 was shot down over eastern Ukraine, killing 298 passengers and crew. The next day, President Barack Obama alleged that the responsible parties were Russian-backed separatists seizing territory in the region following Russia’s annexation of Crimea. Obama’s statement came amid a furious effort by Russian propaganda outlets to foster confusion about the act. In their telling, the tragedy had actually been a failed attempt by Ukrainians to shoot down President Vladimir Putin’s plane. The Russian propaganda effort received a substantial boost when right-wing internet journalist Matt Drudge highlighted a story on the topic from RT.com, the website of the Russian government-backed English-language news channel RT. 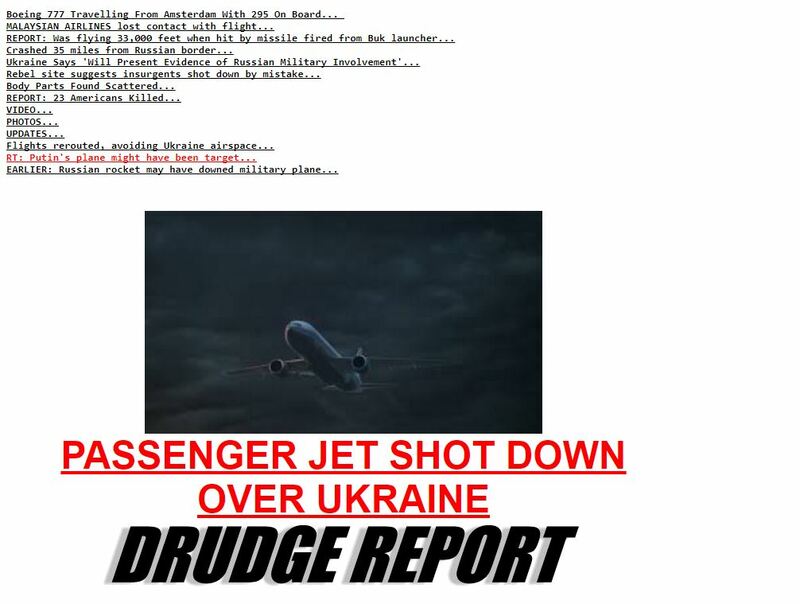 Drudge titled the resulting item on the Drudge Report, his highly trafficked link aggregation website, “RT: Putin’s plane might have been target…” in bright red text. This was not an anomaly. 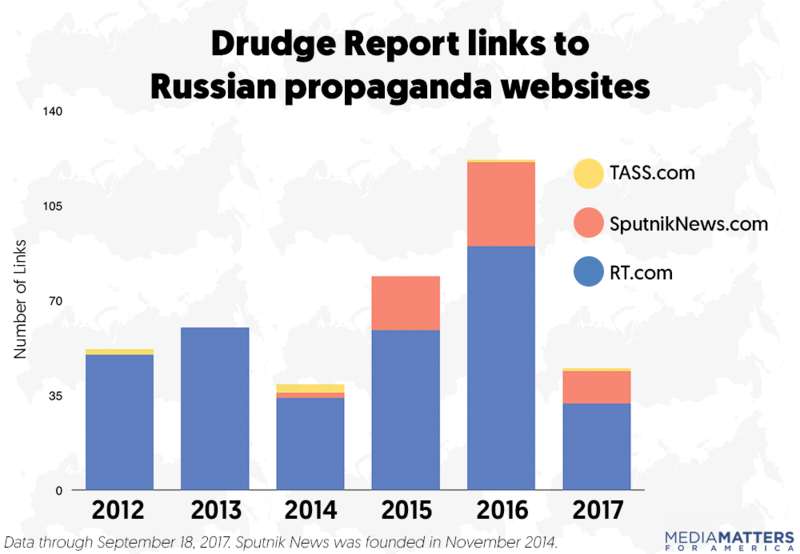 Drudge has for years used his site as a web traffic pipeline for Russian propaganda sites, directing his massive audience to nearly 400 stories from RT.com and fellow Russian-government-run English-language news sites SputnikNews.com and TASS.com since the beginning of 2012, according to a Media Matters review. Those numbers spiked in 2016, when Drudge collectively linked to the three sites 122 times. RT and Sputnik News are part of what the Times’ Jim Rutenberg has termed “the most effective propaganda operation of the 21st century so far,” a coordinated network of state-controlled TV and online media outlets and social media accounts that take advantage of the traditional protections of Western liberal democracies to undermine public confidence in the governments of those nations. TASS, which has received less attention in the United States, is a Russian news agency similar to The Associated Press but owned by the state. Russia’s English-language propaganda operation came under increasing scrutiny from the U.S. intelligence community during and following the 2016 presidential election, during which, according to U.S. intelligence agencies, it was part of an effort to bolster now-President Donald Trump’s campaign. 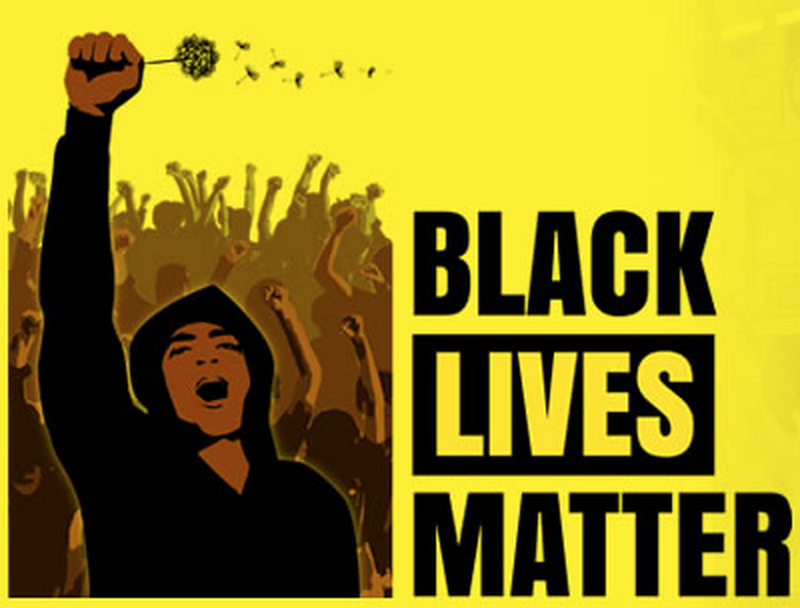 Mixing slanted coverage with outright lies, the state media effort promotes an anti-establishment worldview featuring criticisms of the U.S. from both the far left and far right, packaged with the same strategies used by modern American news outlets to increase viewership. When the Kremlin’s interests converge with the right’s interests in undermining Democratic politicians like former President Barack Obama and former Democratic presidential nominee Hillary Clinton, its outlets find prominent allies in the U.S. conservative media landscape. As Andrew Feinberg, the former White House correspondent for Sputnik News, has explained, the Russian media outlets are part of the “right-wing media ecosystem,” with their stories picked up and promoted by prominent far-right news sites like Breitbart.com and conspiracy theorist Alex Jones’ Infowars.com. For decades, Drudge has played a dominant role in that ecosystem. The Drudge Report is one of the most highly trafficked news websites in the country, and because it simply aggregates links, it is the top source of referral traffic to a host of right-wing and mainstream news websites. That ability to create a firehose of traffic leads some reporters, especially on the right, to craft stories for the explicit purpose of getting Drudge links, allowing him to serve as the media’s assignment editor. And the media outlets benefiting from that traffic are not only U.S. traditional media or conservative outlets, but the press organs of one of the nation’s top adversaries. We found that the Drudge Report has promoted dozens of RT articles every year since 2012. Soon after Sputnik launched in November 2014, it, too, began regularly receiving attention from Drudge. TASS articles receive much less promotion, but Drudge’s website features a permanent link to the TASS main page (listed as ITAR-TASS). As the U.S. presidential race and Russia’s machinations both escalated in 2015, the number of Russian propaganda articles promoted by Drudge shot up to 79 for the year. The total jumped again to a high of 122 articles in 2016, before dropping down to 45 this year through September 18. The articles Drudge highlighted cover a wide range of U.S. and international topics, but — as one might expect from the content of Russian propaganda outlets — many fall into discrete categories that fit the interests of the Kremlin. During the 2016 presidential campaign, for example, several of the Drudge-promoted articles reported on the contents of emails and voicemails the U.S. intelligence community says were stolen from the Democratic National Committee or former Clinton campaign chair John Podesta by Russian hackers. Others promoted the claims of WikiLeaks founder and former RT host Julian Assange. Drudge highlightedcoverage from Russian propaganda outlets of his attacks on Clinton and his contradiction of the U.S. intelligence community over whether Russia was the source of the Democratic emails he published. Drudge has also regularly turned to RT and Sputnik for unskeptical coverage of statements from Putin and other Kremlin officials, including their denials of Russian election interference, their criticisms of the U.S. role in Syria, and their efforts to undermine NATO members. And he’s frequently highlighted the Russian outlets’ conspiracy theories and hysterics, including their reports on meetings of the “mysterious Bilderberg Group,” debunked claims that Google manipulated its search results to favor Clinton, and warnings of increasing Western support for satanism. Drudge’s affinity for Russian president Vladimir Putin and his propaganda outlets is undoubtedly a major asset for the Kremlin. Drudge has rare power as a media gatekeeper due to his unusual ability to push reporting from previously unknown outlets to a massive audience. Jones’ Infowars — also a favorite of the Russian government — is a case study in the potential impact of sustained promotion from Drudge. A 2013 Media Matters study found that the Drudge Report linked to Infowars hundreds of times over the previous two years, giving the conspiracy theory website crucial exposure to the rest of the right-wing media space. Putin could say the same.